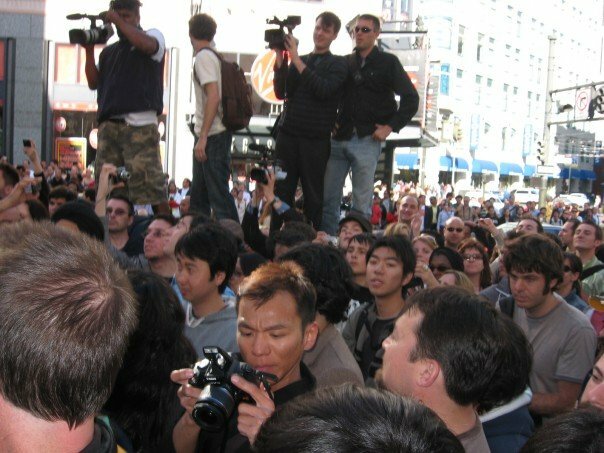 The mob scene outside the SF Apple Store just moments before the original iPhone went on sale. June 29, 2007, is the day I’ve come closest to being trampled to death. I blame Steve Jobs for this. As the countdown clock in the Apple Store window on Stockton Street in San Francisco neared zero, hordes of reporters from all over the world, customers — some who’d waited in line for two days — and curious passersby all at once surged toward the glass to get a better view as the doors opened for the first time to sell the smartphone that has revolutionized mobile computing: the iPhone. Friday marks the five-year anniversary of that day. No product launch has ever come close to the crazy spectacle we saw (and survived) that day. A lot has changed about iPhone launches since 2007. People still line up, some media still cover it, but it’s more orderly now because waiting in line for an Apple phone is not considered unusual, and because iPhone distribution has expanded to include online channels and three major U.S. carriers. The mobile world into which the original iPhone was born has seen other, vast changes in the last five years: Virtual keyboards are now standard; wireless operators changed the way they do business; and a company formed around an app designed on and for the iPhone platform has sold for a billion dollars. Nothing, however, has changed more in those five years than Apple(s AAPL) itself. The iPhone, at first looked upon skeptically by some as an overhyped toy, has catapulted Apple to the top of the technology and business worlds. Apple is valued today at more than $530 billion, which, for those counting, is worth more than two Microsofts(s MSFT) and almost three Googles(s GOOG). 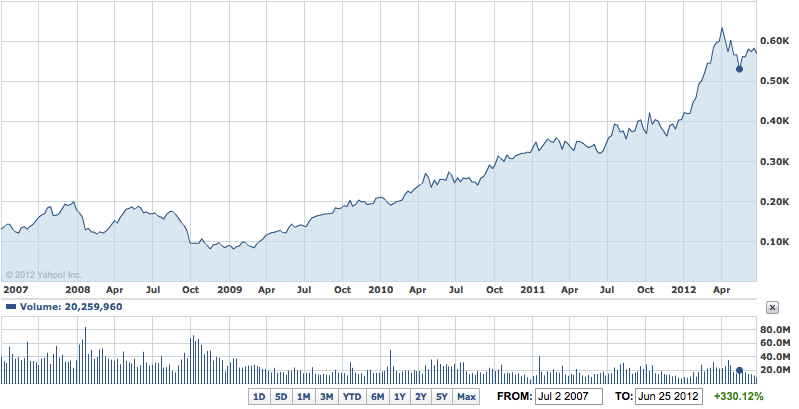 Amd it could buy both of the mobile powerhouses of 2007, Nokia(s NOK) and RIM(s RIMM), outright. That is if it wanted a piece of the disasters that have unfolded in Finland and Canada since the launch of the iPhone. The stock chart for AAPL has pushed steadily upward and to the right since Apple introduced its combination iPod, phone and mobile Internet device. 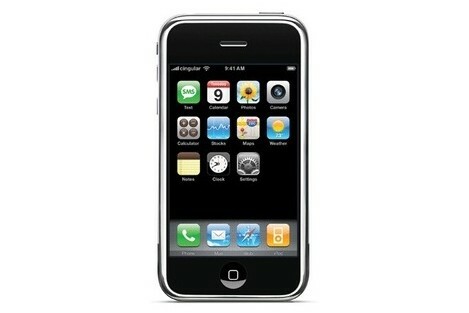 The Monday after the iPhone launch in 2007, Apple stock opened at $132.30. Yesterday it closed at $569.05. Apple’s balance sheet, too, has been transformed by the iPhone. The device has become the engine for an incredible profit machine that drives the whole company. Apple has sold somewhere around 250 million iPhones in five years, according to Strategy Analytics, which is estimated to have added $150 billion in profit alone. Apple hasn’t just sat on its enormous profits, however. It’s put some of it away — it had $7 billion in cash in July 2007, in April it had $110 billion. But it’s put much of it right back into the business of making and selling its phones, iPads and computers and building out its physical stores that help drive more device sales. More recently Apple has opened a series of gigantic state-of-the-art data centers to power the post-PC dream world it has largely created. It uses that money to ensure product supply and ramp production to meet demand, which has the nice side benefit of blocking out potential competition by buying up, for example, the world’s supply of touchscreens. It helps Apple outfit the factories of partners like Foxconn with crazy-expensive, custom laser tools to keep its products differentiated in small but important ways. All of these are strategies that are core to the Apple way. And under Tim Cook’s direction of its operations have been perfected and expanded during the iPhone era. The iPhone, of course, is not just about money. It’s also about vision. The iPod made Apple Computer into a consumer electronics player. But the iPhone altered the company’s destiny and turned Apple into a mobile company — it dropped “Computer” from its name the same day it initially introduced the iPhone in January 2007. No other traditional PC company has managed to make the same switch, and, as noted above, two pre-iPhone mobile giants — Nokia and RIM — are struggling in this new era while the seminal mobile company, Palm, is dead. And since deciding to embrace being a mobile company, Apple’s computer business has, ironically, flourished. Almost every quarter in the past few years has included the phrase “best Mac quarter ever” from an Apple executive’s lips. People likely drawn to its stores for iPhones, and now iPads, are trying out Macs — half of the Macs Apple sells every quarter in its stores are to first-time Mac buyers. The iPhone was also the defining product of Steve Jobs’ amazing career. By proving to Apple, the software development industry and the public that the company understood what mobile users wanted with the iPhone, it made way for the iPad, which was Jobs’ original dream device for mobile computing. It’s fair to say that without the iPhone, the iPad would have been a very tough sell — pre-iPhone, Jobs did not have the influence in the mobile world or the millions of third-party mobile apps that he did in late January 2010, when he first laid out his vision for a 9.7-inch, $500 touchscreen tablet. Without the iPhone, we wouldn’t have Apple pushing innovation in all kinds of areas — App Store, Siri, mobile gaming, how we consume media content and much more — and it’s bringing its chief rivals like Google, Amazon, Microsoft and Facebook along with it. Because of the iPhone, Apple is, right now, the planet’s leading technology company. That success has brought competition on many fronts. But the tech world has never been the same since June 29, 2007, much the same way the debut of the PC and the Mac ended the reign of computing giants like Data General, Wang and Digital Equipment. And for that, we can blame Steve Jobs. Please check out the rest of our stories on the fifth anniversary of the iPhone, collected here. Did you not get the announcement that MobileMe was closed? Apple said that the way they created the iPhone was to look at the market situation prior to 2007, which Apple said was “everybody hates their phone,” and then design a product missing all the characteristics that everybody hated. I have no idea why the industry would design products that would inspire such negative feelings, but the overwhelming success of the iPhone suggests that Apple’s assessment of the cellphone market pre-2007 was correct. Because phone manufacturers prior to the iPhone created products that were easy to… wait for it… manufacture. They never really designed a product from the ground up with no preconceptions.